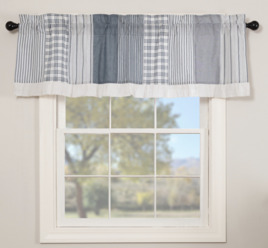 Bring Farmhouse style to your windows with the Sawyer Mill Blue Panel Set and attached Valance. 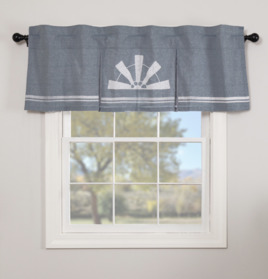 The base is a textured, solid cotton chambray, lined with cotton to reduce fading and light penetration. Choose between short & long panels. 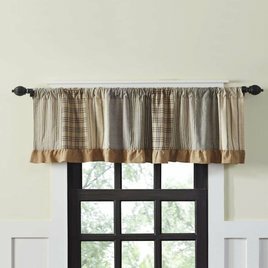 The Sawyer Mill Patchwork Valance is a Farmhouse inspired valance with vertical strips of ash grey, creme, black plaid and striped patches. 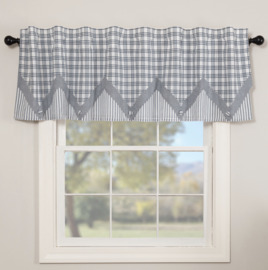 It's finished with a hem fold and the bottom and trimmed with a 3" natural burlap gathered ruffle. 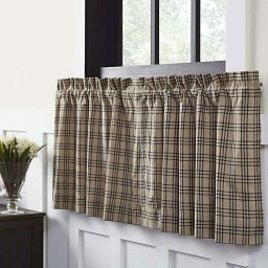 The Sawyer Mill Tier Lined Set of 2 curtains dress up your window with this Farmhouse inspired curtain and it's large-scale black plaid on dark tan. 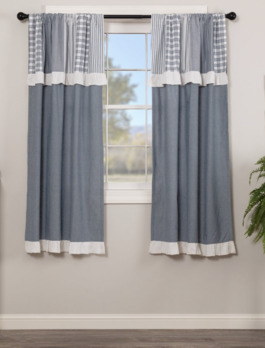 A perfect finishing touch to your cozy room! Available in 2 sizes.